When I was little I collected baseball cards – not because I liked or cared about the sport but because I liked “flipping” cards with the boys and winning their cards during recess on the playground. I also liked the flat, powdery bubble gum stick that came with the cards. My love affair with baseball cards was short lived. A few years later another type of card came along that I could really get into. 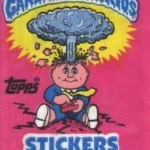 Garbage Pail Kids launched in 1985 – they were a spoof of the insanely popular Cabbage Patch Kid dolls that parents were busy getting in fist fights over. They were gross. Disgusting. Hilarious! 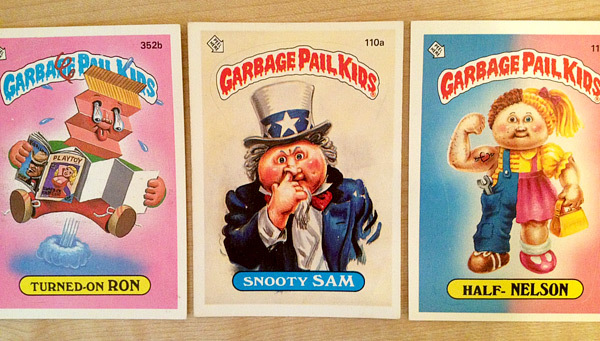 We wouldn’t flip Garbage Pail Kid cards but we would trade them. 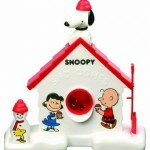 Conversations like, “I’ll give you my Bye Bye Bobby for your Sara Slime” were heard during lunchtime and recess. Even though ours didn’t, some schools banned the cards deeming them too creepy/disgusting. 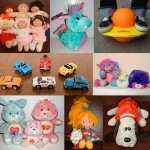 Looking back at some of the more disturbing ones, I guess I can kind of see why…these are kind of extra gross. 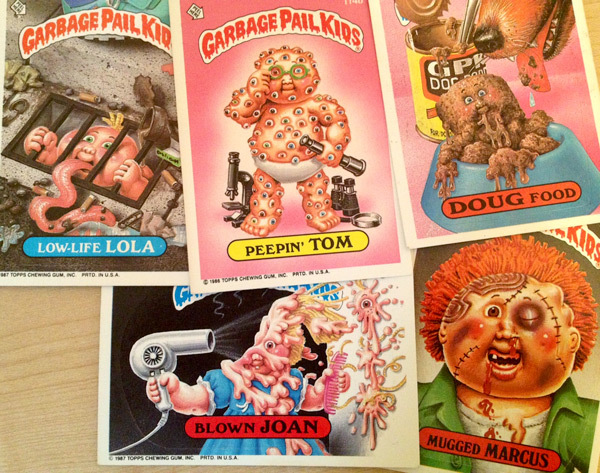 The Garbage Pail Kids were so popular a movie was released starring them. 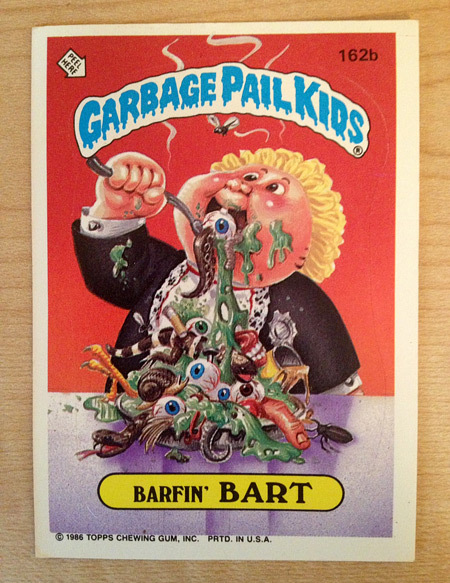 Shockingly the film was a flop but die-hard fans of the cards and the characters ate it up, kind of like the way Barfin’ Bart ate up…well…barf. The cards even made a comeback recently – I was sooo excited to see packs of them available again at the checkout at the grocery store. It totally made me smile and brought back memories of the mid 80’s, saving up my allowance to go up to the pharmacy to buy a few packs of my own. 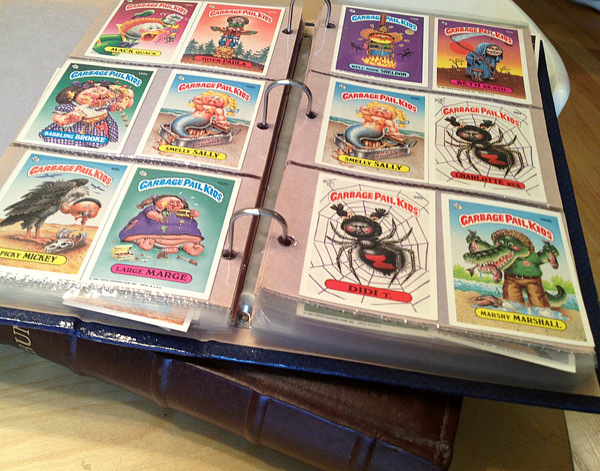 Not that I need any more packs of cards…I kept these giant binders full of them. Why? I’m really not sure. 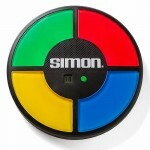 I guess there are some things that are just too difficult to part with. I mean how could you expect me to say goodbye to Gooey Louie, Marcus Mucus or Snotty Sam? 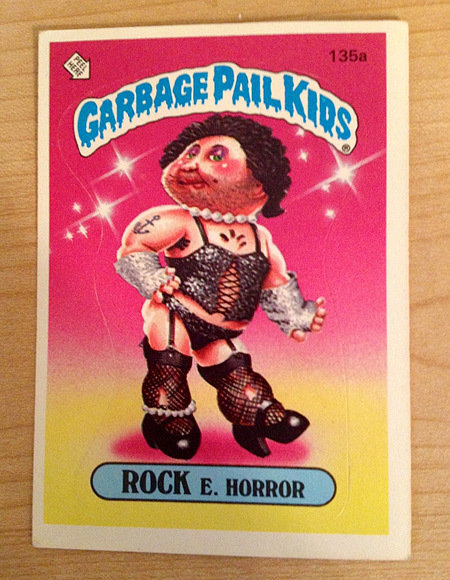 My personal favorite card of all time which I will never ever, ever get rid of is Rock E. Horror. 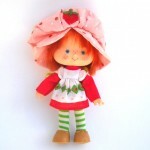 My favorite cult movie mashed up with a cabbage patch kid wearing fishnet stockings? Even if the rest of these somehow make it into the garbage someday, you bet I’m hanging onto that one. “the film was a flop but die-hard fans of the cards and the characters ate it up” No they didn’t, they hated it, because it’s the movie equivalent of cancer. You’re stupid. Must you resort to personal insults just because someone has a different viewpoint than yourself? Now THAT’S stupid.